It’s not often that a remodeling project grows out of a high-compliment-turned-mild-insult. While relaxing at their home in North Houston’s sought-after Champion Forest neighborhood, the homeowners answered a knock at their door and met a couple who wanted to buy their house. It wasn’t on the market, mind you, and the homeowners had no plans to sell it, but they invited the admirers inside for a tour anyway, thinking that if the price was right, just maybe they’d be compelled to reconsider. One look at the cramped master bathroom, however, and those suitors made a beeline for the door, never to be heard from again. The experience got the homeowners thinking that, perhaps, a renovation was in order. 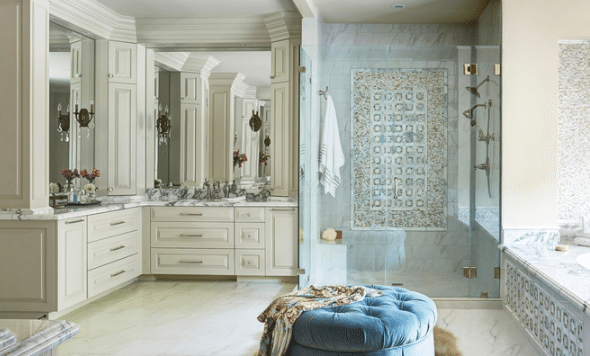 As beautiful as their traditional home is, the master bathroom hadn’t been updated in about 20 years. It had a whirlpool tub that never got used, probably because the space itself was so uncomfortable to linger in. As the scurrying suitors pointed out, the bathroom was cramped, the counters were cluttered and the oversize soffits made the place look even smaller. The tile was outdated, the solid-surface countertop was stained and cracked, and the whole space was just crying out for help. The project was unusual from the start. In fact, the entire trajectory of the renovation flowed from a single unconventional decision: The home’s three-car garage, which was adjacent to the master suite, would be converted into an extra-large master bathroom and closet, complete with a fireplace in the boudoir. The next two years were spent completing the conversion and building a new garage slightly removed from the home. The first order of business was swapping the placement of the bathroom and closets. The two master closets used to be where the two vanities are now, giving some idea of how awkward the original closet situation must have been. Built into the vanities are pullout drawers for dirty towels and the like. And three vertical towers hide the electrical components to keep the countertops free of clutter. Interior designer Cindy Aplanalp-Yates worked meticulously to ensure that every time the couple passes the threshold of their suite, they feel as though they’ve stepped into a five-star hotel. 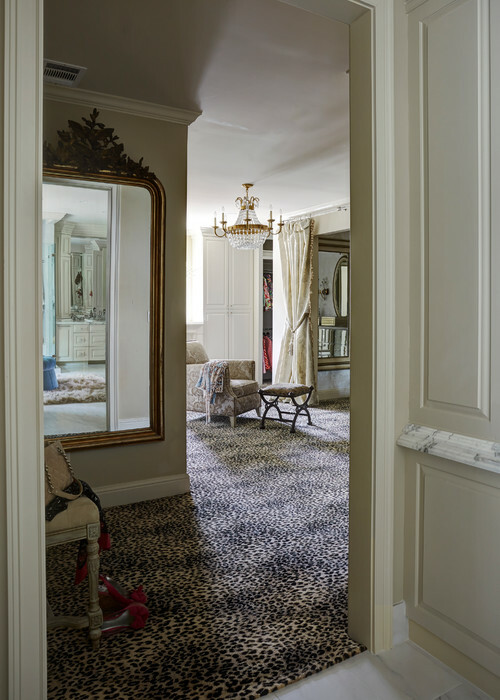 The doorway leading from the master bedroom to the washroom wasn’t centered originally, so the designer had it reframed and moved about 1½ feet to create symmetry. 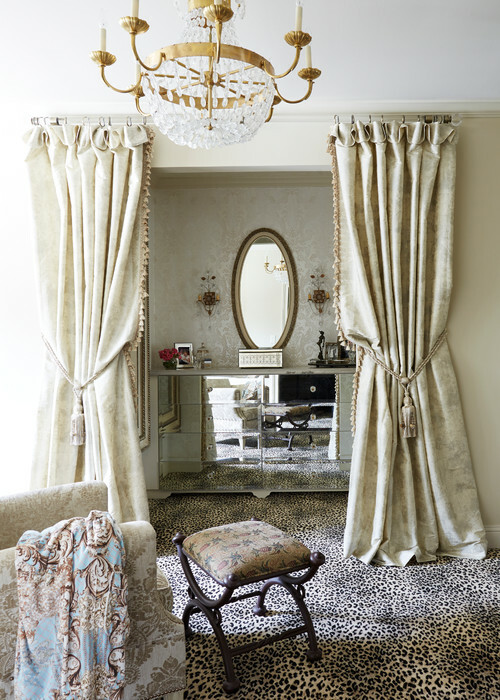 The top-down/bottom-up shade, valance and draperies were custom-made for the space, while the ottoman was a piece the couple already owned that they had re-covered in a Duralee velvet. The Tibetan curly sheepskin rug and throw blanket add to the luxury, creating a little island of softness in the middle of this spacious bastion of marble. 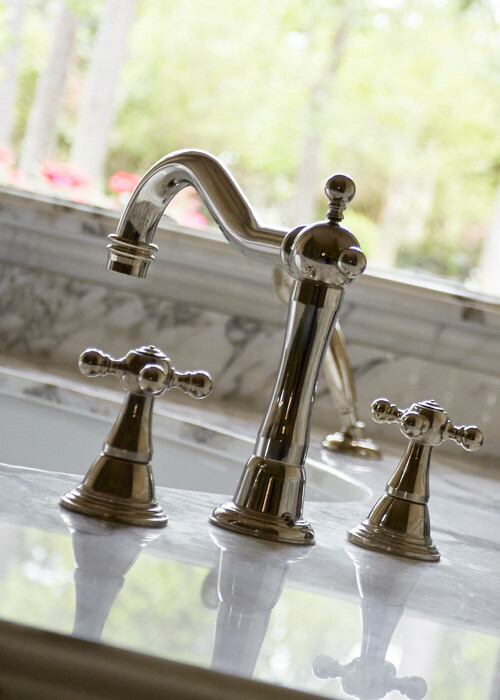 “I love doing remodels, because we can really splurge and do something wonderful if we don’t have to do a whole house,” Aplanalp-Yates says. Though this successful couple is not the type to spend gratuitously, they knew that they wanted to create something special in this space. The polished marble countertops were undoubtedly a splurge, while the floor tile is a lower-maintenance engineered stone designed to resemble marble. 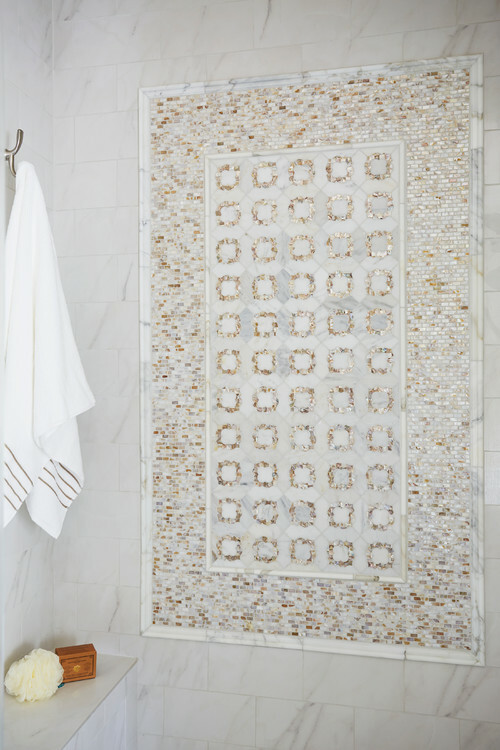 The shower wall of Cassie Chapman marble tile with mother-of-pearl inlays was the jumping-off point for the entire design. “When you find a starting point, something the client absolutely loves, it helps you pull everything together,” Aplanalp-Yates says. Since the couple plans to reside here into their golden years, everything was designed to remain user-friendly at any age. The shower meets Americans With Disabilities Act specifications; the toilet and all doorways have a 5-foot radius to accommodate wheelchairs should the need one day arise. This gorgeous animal-print carpet, from Kane Carpet’s Kaplani collection, is called Nimble Lynx. A built-in desk covered in mirrors provides a great spot for putting on shoes or applying makeup. It is a charming gift to one homeowner from the other, who had intended this as a compliment — one that, well, didn’t come out quite right. Today, this adorable blunder, and the couple’s gentle sense of humor, is immortalized forever as an especially touching element of their new and improved home. Which metros have the most diverse dining?